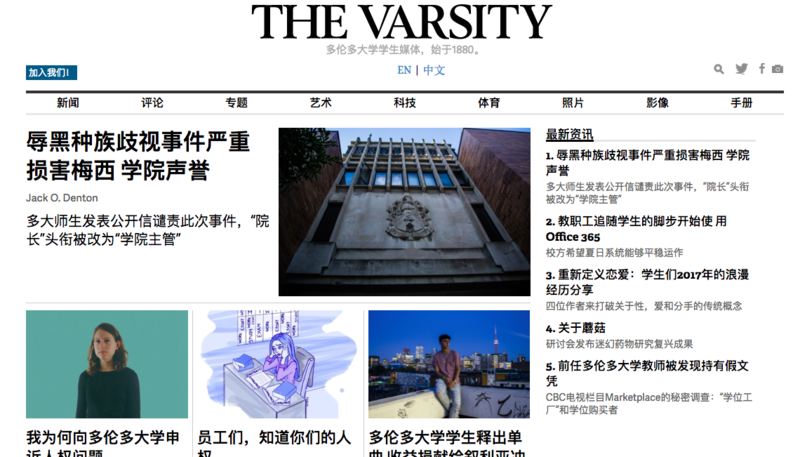 The Varsity, a student newspaper at the University of Toronto, launched a Chinese language edition of its website. Screenshot by J-Source. The Varsity editor hopes Chinese-language edition will serve University of Toronto’s 10,000 Chinese students. On Sept. 18th, the Varsity, a student newspaper at the University of Toronto, launched a Chinese-language edition of its website. The new subsite contains select articles from the Varsity’s English language publication that have been translated into simplified Chinese. The idea for the Chinese-language edition was born in June 2017, when Celine Liu, a University of Toronto graduate, approached Jacob Lorinc, the Varsity’s editor-in-chief, to discuss how the publication could better cater to Chinese international students. Liu is the founder of the Listeners, a non-profit campus organization that provides peer support to students, and works frequently with the international Chinese student community. An international Chinese student herself, Liu said she noticed recurring themes in what students were disclosing to her. For Lorinc, publishing a Chinese-language edition of the Varsity was an opportunity to engage more students with the Varsity’s work. Of the approximately 17,000 international undergraduate and graduate students enrolled at the University of Toronto, about 10,000 are Chinese. Beyond appealing to numbers, however, Lorinc spoke to the Varsity’s role as a public service for university students. “Not only is it a great way to get these students involved with on campus events and initiatives, it also gives the Listeners … some exposure for their charitable cause,” said Rock Li, a fourth-year undergraduate student at the University of Toronto. Some readers have suggested that the Varsity should offer the Chinese-language edition in both simplified and traditional Chinese. 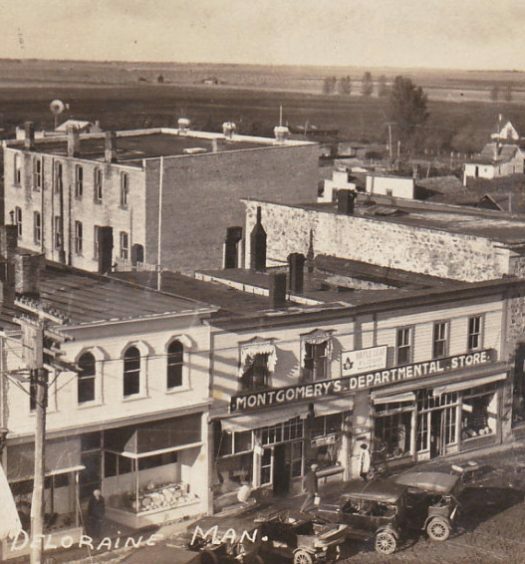 Some negative responses argued against having a Chinese-language edition of the paper. Other campus newspapers have taken note of the Varsity’s Chinese-language edition, including the the Ubyssey at the University of British Columbia. According to Lorinc, the Varsity is the first Canadian publication, student-run or otherwise, to concurrently offer content in English and simplified Chinese. Currently, the Chinese-language subsite is translated by students, most of whom are recruited through Liu and the Listeners. Going forward, both Liu and Lorinc hope the Varsity will be able to publish original articles written in Chinese. There is a historical precedent for campus newspapers with origins as translated editions of English language publications: Le Delit, the only francophone paper at McGill University, was initially the French-language edition of The Daily, an anglophone paper at McGill. Le Delit became an independent student newspaper with original French reporting in 1979. Lorinc notes that creating the Chinese-language edition was a surprisingly easy process, and only required small adjustments to the Varsity’s website. 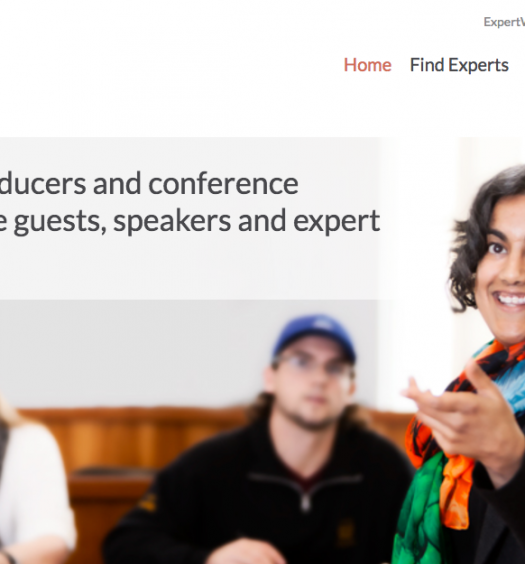 It’s something that other publications absolutely can do,” he said.